Recently Google announced intentions to make audio content more searchable. Text has obviously been Google’s bread and butter over the last 10+ years. They figured out how to parse through all the text on the Internet and make it searchable and easier to find for Internet users. When Google purchased YouTube about a decade or so ago it raised eyebrows. Slowly and in the background Google has improved the way we search for video. If you remember in the early days of YouTube things were pretty basic. The title made it possible to find videos. Maybe the description, but those were rarely filled out by video creators. And they actually allowed you to list keywords and categories for the videos, which wasn’t always the most accurate way to organize the content. But now Google and YouTube have been getting really good. Some videos get transcribed seemingly with software and that makes it easier for the search engine to understand what the video is about thus making it easier to organize and easier to make it possible for people to quickly find relevant and helpful videos. Now they’re looking to do the same with audio and especially with podcasts. I mostly use Apple’s Podcast app to listen to podcasts. They do a pretty good job of showing popular podcasts and new podcasts, but beyond that it’s difficult to search for new podcasts to listen to. You pretty much only search the text that’s available, which is the title or description. And that’s about it. It’s similar to the way YouTube was about 5-10 years ago. When I search for new business podcasts I’ll type in a word like “business” and I’ll see podcasts with that word in the title. That’s fine, but it’s not always giving me the most relevant results which might be the most popular business podcasts that might not even have the word “business” in the title. Sometimes I’ll search for a specific name of a person when looking for new podcasts or even episodes. This works pretty well. I can usually find all the podcasts that a person has been a guest on or I’ll find their podcast. But it’s only if that person’s name is listed in the description or title. 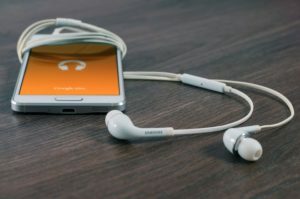 Like the early days of text and video communication, the basic nature of search in audio right now makes it possible for marketers to get the wrong idea about ranking well or appearing in searches. It can lead to keyword stuffing in the titles and descriptions because that’s about the only way people find podcasts right now. I don’t see a ton of that going on with podcasts and audio and that’s a good thing. But it’s something to watch for if you’re in the podcasting field. Another thing to watch for as Google and other search engines improve is to watch what you’re saying in podcasts. You don’t really see it now, but I could see some getting trapped by this and that’s stuffing keywords and awkward phrases right into their recordings as they try to rank better for certain things. For example, instead of just naturally recording an interview a podcaster might try to say the word “business” 50 or 100 or whatever number of times in the episode. Just to really try and prove to the search engine that their podcast and episode are about business. First, Google is getting serious about improving audio search. That’s another indication that audio could really boom in the future. Gary Vaynerchuk is a believer in the future of audio. He believes that it’s all about time. You can do two things at once with audio. Listen and drive. Listen and brush your teeth. Listen and eat. The easier it becomes to search audio the better for consumers and the more likely we’ll see the popularity of audio increase. Second, you can’t really fool Google when it comes to text anymore. They know what you’re writing about. They know how your brand is perceived. The best SEO strategy is to answer the questions your target audience is asking and really ignore what you think Google wants from you. You have to trust that they can figure it out. That is the best approach to take with podcasts and other audio content as well. Don’t get trapped trying to stuff keywords or alter your titles and descriptions. Do your best to create the best audio content for your listeners and trust that Google will take care of the rest.